​we always strive to give the best to our customers. It all started with The Clock Shop in 1986. The Clock Shop has a long history in Rapid City dealing in pre-owned clocks, watches, and jewelry. 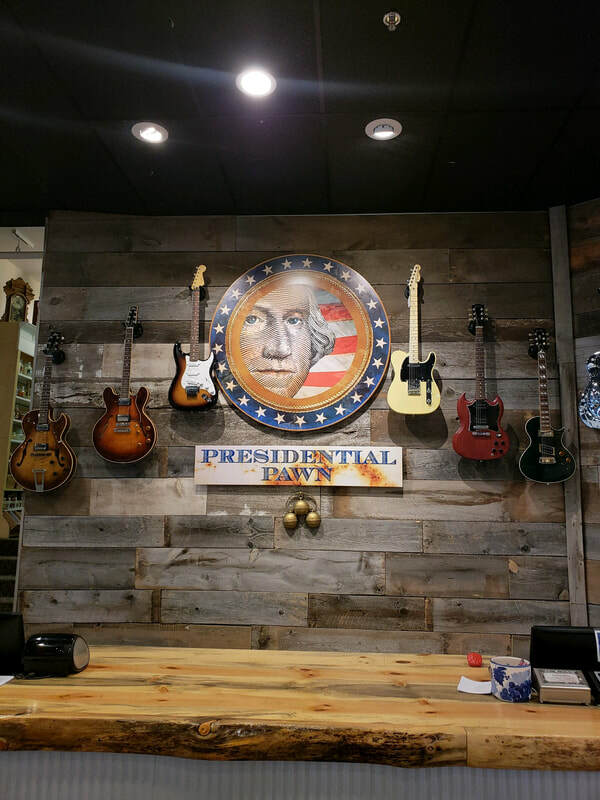 After receiving countless requests to start taking other items, Presidential Pawn & Gun was born in 2011 by Chris and Trevor Johnson. With an ever-increasing lure to the rare and odd item, the Johnsons decided it was time to create something the world has never seen before. Merging the existing idea of a pawn shop, with the novelty items housed in museums, the world's only Pawnseum was created in 2015. Today, Presidential Pawn & Gun, The Clock Shop, and the Pawnseum rest under the same roof, essentially as one big store. 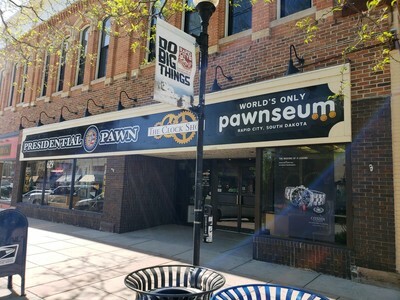 Now, when you stop by to visit Presidential Pawn's ever-changing inventory, or realize just how large a selection The Clock Shop offers, or how close you are to actually touching a piece of a space ship at the Pawnseum, you'll realize why people are talking about downtown's favorite place to shop. Our shops really have a unique feel, and we are proud to be located in the heart of historic downtown Rapid City. ​You never know what you'll see when you stroll through our stores, but we'll do everything we can to make it an experience rather than just a visit. Our founders have a passion for unique and one-of-a-kind items and are always excited to be blown away by what comes in our doors next. We are proud to have a class III federal firearms license, plus an on-site jeweler, and clock & watch repair departments. See what the locals are saying about us. "To appreciate the Clock Shop and Presidential Pawn in downtown Rapid City, you need to know about Chris Johnson, who grew up 200 miles to the east in Highmore." "Chris Johnson has been accumulating enough unique historical artifacts through the years to blur the lines of definition between pawn shop and museum." "The Clock Shop and Presidential Pawn held a special unveiling Thursday for the latest item added to what they're calling their new 'Pawnseum.'" "Trevor Johnson, president of Presidential Pawn, and Cory Condon, manager of Presidential Pawn, discuss the revamped city ordinance that regulates pawnshops, secondhand shops and precious metal and gem buyers." The items in the "pawnseum" are for sale, but the owner is in no rush to sell some of the more museum like items. These items include a sequined glove worn by Michael Jackson, artifacts from the Apollo moon mission, 35mm negatives of John F. Kennedy Jr. saluting his father during the funeral procession among other things. "Ron Johnson never expected a potentially explosive situation might arise Tuesday when an elderly woman reached into her purse hoping to sell a piece of World War II memorabilia." "The Clock Shop of Rapid City and the Adams Museum are partnering up to host a pour party celebrating this brand new piece of Black Hills history, created by melding the mold and gold of two of the area's largest gold nuggets." "The owners of The Clock Shop will open what they call a natural progression for their business - a pawn shop - on Monday around the corner on Seventh Street." "A replica of the original nugget was created because of a 5.27 troy ounce nugget discovered in 2010, named the Icebox nugget. Placer gold found at the same site as the Icebox Nugget was melted into a replica of the PCJ nugget, which was donated for auction by the Rapid City Clock Shop." "Ward and his partner, who call themselves the "Ice Box Mining Company," sold the precious nugget for an undisclosed amount to Chris Johnson, owner of the Clock Shop in downtown Rapid City, which often buys gold from prospectors."